Fort Ancient near Cincinnati, is one of the world’s preeminent earthen hilltop enclosure: three miles of sinuous walls enclose a hundred acres, opening at 67 stone-lined gateways in various complex designs. The site overlooks a narrow, wooded gorge of the Little Miami River, and can be explored via many hiking trails. The walls are followed by a necklace of man-made ponds, and enclose a perfect square of stone mounds aligned to sun and moon rises. 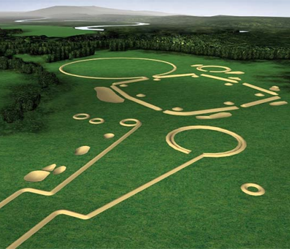 Serpent Mound in Adams County, is the world’s greatest earthen animal effigy. It slithers across its undulating hilltop with three perfect coils, an elegant spiraling tail, and an elaborate head formation that points directly at the summer solstice sunset. The cliff beneath echoes the serpent’s form with a jutting rock as a “head”. 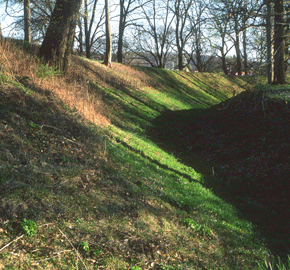 Newark and Mound City are large Hopewell period complexes near Chillicothe. These earthen structures represent the culture’s elaborate funeral practices and artistic achievements – the apparent center of a cultural heartland with extensive ties to most of North America around AD 200-300. The Ancient Ohio Trail is a collaboration of all the major owners, managers, and interpreters of Ohio’s primary earthwork sites: The Ohio Historical Society, The US National Park Service, The Arc of Appalachia Preserve System, The Dayton Society of Natural History, the Newark Earthworks Center at The Ohio State University – Newark, and the Center for the Electronic Reconstruction of Historical and Archaeological Sites (CERHAS) at the University of Cincinnati. The National Endowment Humanities provided major funding, with significant in-kind resources from all partners. 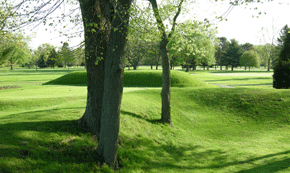 Today four of the Ohio earthwork sites are on the United States Tentative List for UNESCO World Heritage nomination: Serpent Mound, the Newark Earthworks, Fort Ancient, and Hopewell Culture National Historical Park at Chillicothe. Although the United States participation in the World Heritage program is at risk, the consortium of partners are hopeful that the nomination of these significant sites can move forward. Many thanks for information on the Ancient Ohio Trail from John E. Hancock (Cincinnati) and Richard Shiels (Newark) who serve as the Project Co-Directors.